Facebook, the social networking giant now lets you to edit post after you publish it. This feature has now come to the web and Android platform, and it will soon be available to the iPhone, iPad and iPod touch devices. Previously, we have to delete the post if we made a mistake or a typo in it, and thereby losing all the comments and likes, but not anymore. 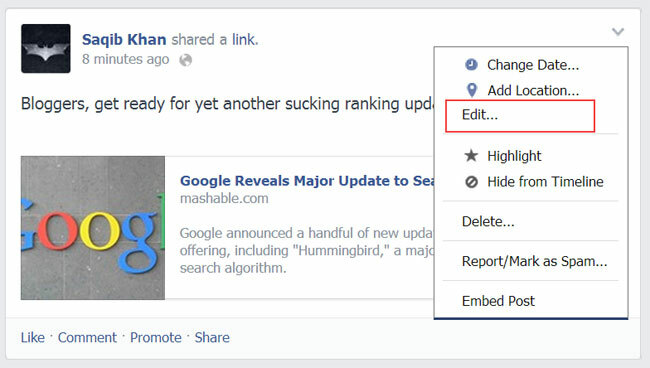 Now you can simply edit the status update on Facebook and correct your typo. However, with this feature there’s a danger of users misusing it. For example, a user would write something to receive likes and comments, and then the user can edit the status update to reflect something else. Now this is a serious concern for users, but that’s why Facebook displays “edited” link in the post. Anyone whom you’ve shared the post with can click on the “edited” link to view edit history. This means that even though a user can edit the entire post, the history will reveal everything about it – from what was it written originally to what was it changed to. To edit a status update/post on Facebook, you need to click on the down arrow in the top right corner of your post and select “Edit” from there. You can now edit the post, and once done, click on the “Done editing” button. 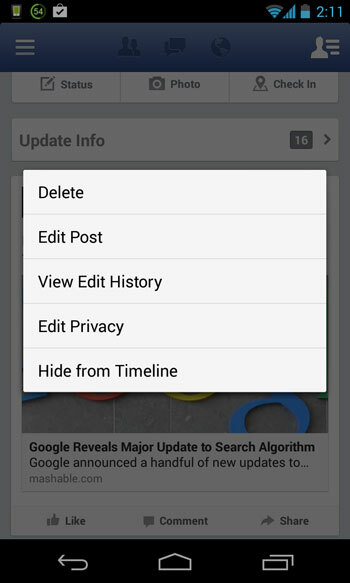 Since you’ve edited the post, Facebook will now show an “Edited” option which will display edit history to all the users whom you’ve shared the post with. To edit a post on Facebook’s Android app, tap on the small down arrow at the top right corner and then tap on “Edit post” option. You can then edit your post and hit the Save button. Facebook has slowly been giving more editing rights to users. Previously the social network allowed users to edit comments, and now it allows users to edit status updates.